The geography of Ecuador is broken up into three distinct regions not including the beautiful Galapagos Islands. The Pacific Coastal Region known locally as "La Costa", is the land between the Pacific coast and the Andes Mountains. This land runs about 187 miles wide and sees a great variety of landscapes, ecosystems, and of course, people. In this area, you will find a major plantation of Dole and Chiquita bananas, along with great sites to surf and beaches that glow with beauty. The Coastal Region contains the most populace city in Ecuador, the city of Guayaquil. The next region of Ecuador takes you into the rocky region of the Andes Mountains. The Andes Mountain Region contains volcanoes and mountain peaks with year-round snow. Quito, the capital city of Ecuador , is where we will see our journey begin. This historic city is on the UNESCO World Heritage List. It was founded in the 16th century on the ruins of an Inca city, and is the best preserved, least altered historic centre in Latin America, despite an earthquake in 1917. Our journey then takes us to the Chimborazo Province, where you will find the highest peak in Ecuador. Mount Chimborazo is an inactive volcano that last erupted in 550 AD. This is a special volcano because it is actually the point on the Earth's surface that is furthest from the Earth's centre. The Province's capital, Riobamba, is within a close proximity to this volcano, and also contains an Open Air Market that supports local agriculture. The last region of Ecuador is the spectacular Amazon Region also known as "el Oriente". This diverse region is located on the eastern portion of the country, and is home to the Ecuadorian Upper Basin. This Basin is home to several indigenous nations, each of who has their own language. Oil fields are located in this region. There has been severe environmental degradation and oil pollution in some areas. The Amazon Rainforest is filled with many species of plants, mammals, insects, birds, and reptiles. The Amazon Rainforest is one of the most diverse and also one of the richest regions on the planet. Because of its vegetation, and the continuous recycling of carbon dioxide in oxygen, it has been described as the "Lungs of our Planet". In Ecuador, the Rainforest has one of the greatest densities of unique species on earth. It also has the second highest deforestation rate in South America and the highest in an Amazonian country. With this in mind, Ecuador has taken a step forward, that is unlike any other; the constitution. In 2008 Ecuador granted rights to Nature. Written in the constitution, this passage speaks of the rights that Nature has in the country, "has the right to exist, persist, maintain and regenerate its vital cycles, structure, functions and its processes in evolution." This differs greatly from Canada's "Ministry of Environment," which is more about managing how humans use the environment rather than Mother Nature, herself. President Rafael Correa believes that trees, animals, rivers, and eco-systems themselves, deserve to have a voice. The constitution was first exercised in 2010 by two American residents of Ecuador. The couple believed that a government road construction crew was damaging the river by their home. The case was later won by Nature, and the construction crew was to fix the damages they caused to the river. This was the first case for Ecuador, and the world, establishing a new legal precedent. The Yasuni National Park is located in the Ecuadorian Amazon, and encompasses one of the most biologically diverse forests in the world. The Park is home to a variety of tree species, as well as record breaking numbers of species of birds, bats, insects, frogs, and fish. It is home to thriving populations of carnivores such as jaguars and harpy eagles. Yasuni is also a shelter for more than 20 globally threatened mammal species, including the white-bellied spider monkey. The Park is also home to some of the lat remaining indigenous peoples still living in the Amazon. For this reason, President Rafael Correa wants to reserve the beauty and diverse Park. He made a proposal to not exploit 20% of the country's untapped oil reserves. 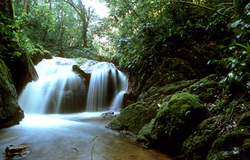 The reserves lie under Yasuni National Park. 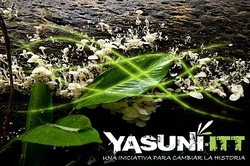 The Yasuni-ITT initiative promises to leave the oil in the ground as long as the global community takes co-responsibility and contributes half of the profits over 13 years; $3.6 billion. Ecuador's economy depends highly on oil, and nearly 30% of Ecuadoreans live below the poverty line. Yet the country is very supportive of the idea to preserve Yasuni's oil. So far the global community has raised $300 million all together.